Yesterday was a bright and hazy Autumn day (some of the photos are a little hazy actually; my son took them and he was struggling to see in the bright sunshine). The colours of the foliage seemed to sing out and every burnished leaf on the ground looked beautiful. My children and I went to visit my brother, sister-in-law and their one month old daughter. She’s an absolute blessing and we adore her. The children took turns pushing their cousin in her pram during a walk into the village. A simple and perfect day. 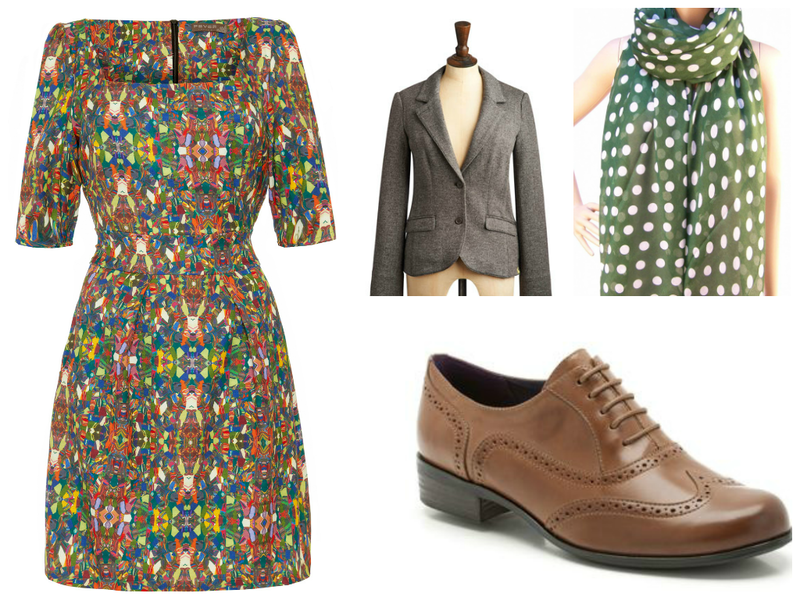 The colours in my dress are very Autumnal and I added an olive green polka dot scarf from my boutique. I had a lovely email from a lady in Budapest, who follows my blog and who ordered one of these scarves. She has asked for advice on styling it, so I hope today’s outfit provides some inspiration. And here’s Kitty Anna. Isn’t she just beautiful? I like the scarf, but you describe it as olive. In the picture it's more forest. I'll order if the latter, but I don't like olive. Thanks.